The people in the streets of Malaysia were confused when a row of cop cars started chasing after a minivan through a busy street. Fortunately, no criminals were let loose that day. The large-scale cop chase turned out to be an action scene for the new film The Leaker <洩密者>, starring Francis Ng (吳鎮宇), Chilam Cheung (張智霖), and Charmaine Sheh (佘詩曼). The film is Francis and Chilam’s first collaboration since TVB’s 2015 film Triumph in the Skies <衝上雲霄>. The Leaker centers on a bust case involving a Malaysian pharmaceutical company. Chilam portrays Lee Wing-kan, a Malaysian detective, and Francis plays Wong Tai-wai, a Hong Kong policeman. 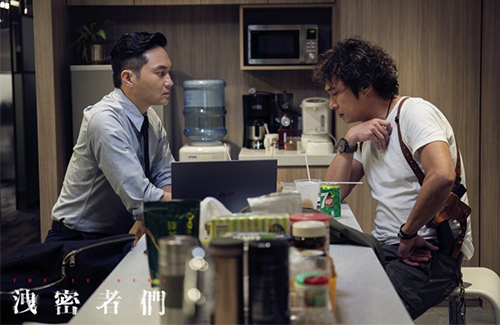 Said scene centers on Francis, disguised as a truck driver, chasing after a culprit while Chilam and his team closely follow him. Despite the dangerous stunts, Francis and Chilam said they felt safe with the crew, as they all had professional stunt training. Omg, same group of people again. I feel only in HK that you see the same group of people over and over again whether its tv or film. Sigh….